The great Indian rhinoceros (Rhinoceros unicornis) also known as the greater one horned rhinoceros is listed as Vulnerable, native to the Indian subcontinent. The rhino’s most important habitat include entire stretch of the Indo Gangetic Plain of northern India and southern Nepal. As per survey in 2015, Total 2,544 greater Indian rhinoceros are estimated to live in the wild forest of India. 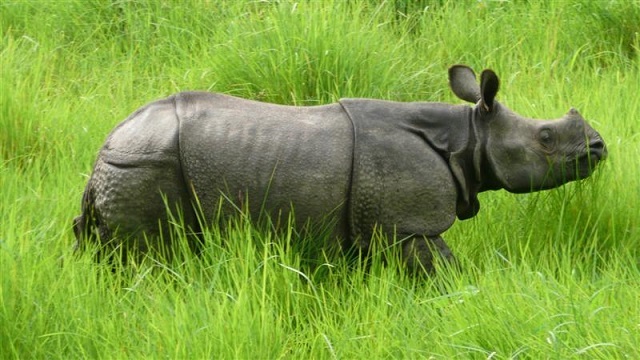 One horned rhinos range include grasslands of the Terai and Brahmaputra river basins across the entire northern part of the Indian Subcontinent. Kaziranga National Park of Assam is home to 1,855 adult Indian rhinos and also host one of the highest density of Tigers in India. 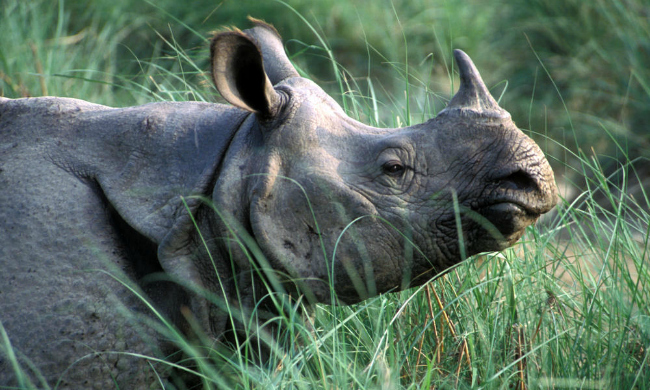 Kaziranga is a World Heritage Site and hosts two thirds of the world’s great one horned rhinoceroses. The park also combines high species diversity and recognized as an important bird area. Kaziranga also has significant populations of large herbivores include Elephants, Gaur, Wild water buffalo, 9 primate species, 4 species of wild cats and largest snakes of reticulated python and rock python along with longest venomous King Cobra snake. 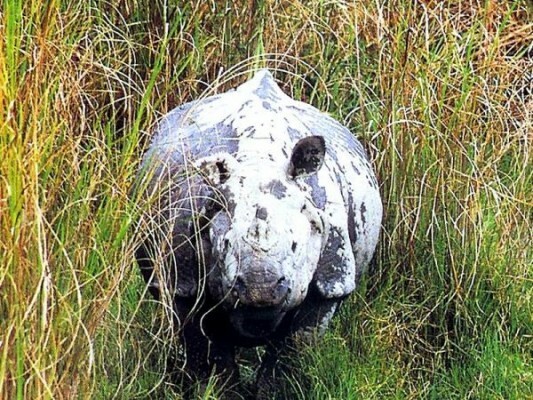 Pobitora Wildlife Sanctuary shelters the highest density of Indian rhinos in the world, located 30 km east of Guwahati. The sanctuary has a dense population of the Great Indian one horned rhinoceros and also home to more than 2000 migratory birds and various reptiles. 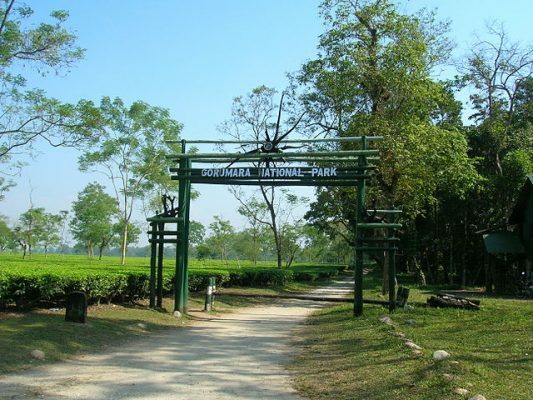 Jaldapara National Park at the foothills of the Eastern Himalayas is a vast grassland with patches of riverine forest. 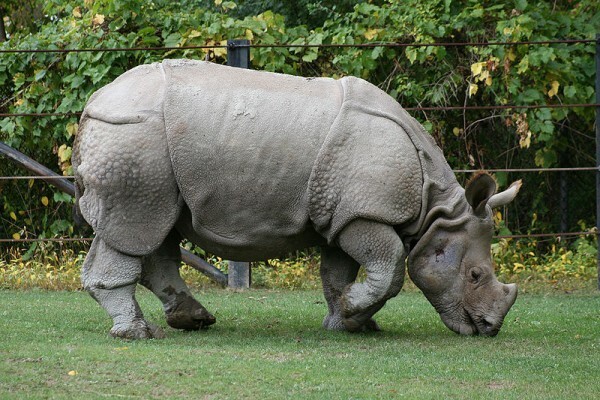 The park offers great variety flora and fauna and has the largest population of the Indian rhinoceros in West Bengal. Orang National Park on the bank of the Brahmaputra river is also known as the mini Kaziranga National Park due to similar landscape and grassland. The park has a rich flora and fauna including wild water buffalo,pygmy hog,royal Bengal tiger and great Indian one horned rhinoceros. 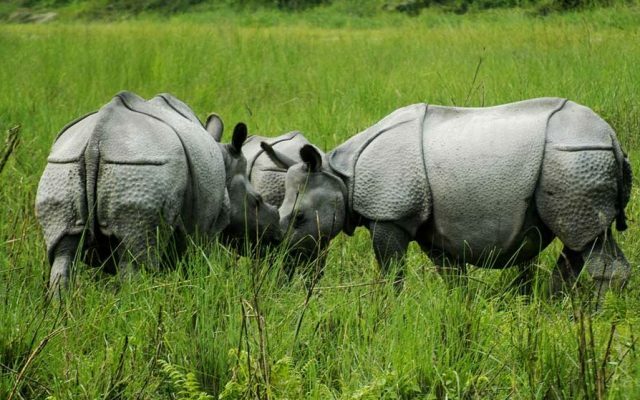 Gorumara National Park in the Dooars region of northern West Bengal is primarily known for its population of Indian rhinoceros. The reserve forest is located at the Himalayan foothills, very close to Jaldapara National Park. Manas National Park in Assam is known for its rare and endangered endemic wildlife, The fauna of the sanctuary include Indian elephants, Asian water buffaloes, Gaurs and Indian rhinoceros. Manas is famous for large population of wild water buffalo in India and also has largest population of the endangered Bengal florican. Dudhwa National Park in the Terai region of Uttar Pradesh is home to large number of endangered species such as Barasingha,Hispid hare and Indian rhinoceros. 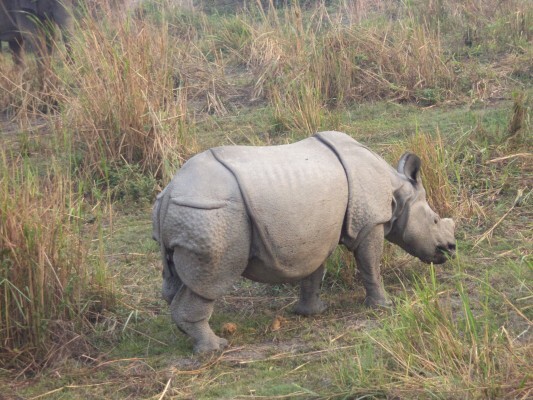 Indian rhinoceros was reintroduced into Dudhwa National Park and along with Kishanpur Wildlife Sanctuary and Katarniaghat Wildlife Sanctuary it forms the Dudhwa Tiger Reserve. 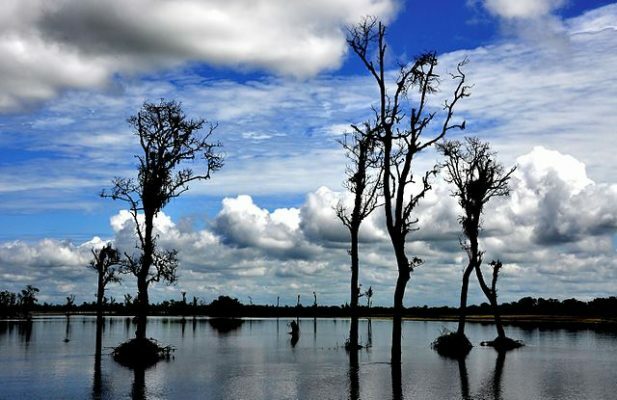 Dibru Saikhowa National Park of Assam is the largest swamp forest of North East India, bounded by the Brahmaputra and Lohit rivers. The park host many species of rare and endangered endemic wildlife including Hoolock gibbon,capped langur,Asiatic water buffalo, and feral horse. Dibru Saikhowa National Park is the only place to spot wild feral horse in India and other rare creatures of park include Chinese pangolin,jungle cat, Gangetic dolphin and Clouded Leopard. Royal Manas National Park is the most famous park in Bhutan and home to Bengal tigers, elephants, gaur,rarer golden langur, wild water buffalo,species of rare migratory game fish called mahseer and one horned rhinoceros. Chitwan National Park is home to at big 6 species of mammals including wild elephant,Gaurs sloth bears, Leopards,Bengal tiger and Rhinoceros. There are 645 rhino are living in Parsa National Park,Bardia National Park and Shuklaphanta Wildlife Reserve. Rhino poaching in Assam is the major wild animal issues in India, As Illegal rhino horn trade has been increased in the black market. 4 One Horned Rhino National Park of Assam host 95% of the total wild One horned rhino in the world and poaching is the only important reason for the decline of the Indian rhino.